77% of consumers support receiving marketing communications through email. Email marketing helps you to develop personalized campaigns that generate enhanced engagement with prospects and customers. With all major players having a defined email marketing strategy, segmentation will be the key for having a competitive advantage. Before we move on to the actual strategies, let’s see why segmentation occupies a prime place today. More than HD quality images, customers are likely to click on mails that have their names and personal interests. Every customer is unique in interests, sources, geography, life and sales cycle stage. Now, moving on to actionable segmentation strategies. Men are from Mars, women are from Venus. This statement rings aptly for email segmentation. Gender segmentation will work when you have a wide variety of products to offer to customers. Segment according to gender and personalize communication according to the specified tone. Two email campaigns for hair care products for men and women respectively. A gender neutral product that you want to market as a gift or direct purchase. Some product and services require different levels of response for different products and service. In that case, you should draft emails that elicit different responses from separate age groups. A college graduate will respond distinctly than a middle aged individual with a stable salary. Campaigning for child care products towards couples for direct purchase and grandparents for gift purchase. A car show car mailing different car segment campaigns towards recent graduates below 30 and top career executives beyond 40. Your digital platform may, or rather, must have a 'my profile' section for every customers. Serious shoppers will list out their brand preferences, shopping habits and other lifestyle habits. Through analytics, you can observe trends or patterns that can help you draft personalized marketing campaigns based on relevant customer needs and wants. Fashion retailers who want to know which brands make the customers tick (example Arrow, Nike, Adidas etc) and according draft email campaigns to spur action according to customer wants. You can utilize customer buying history to offer relevant products/services or conduct white space advertising. You can also adjust current campaign content based on drill downed customer purchasing data. 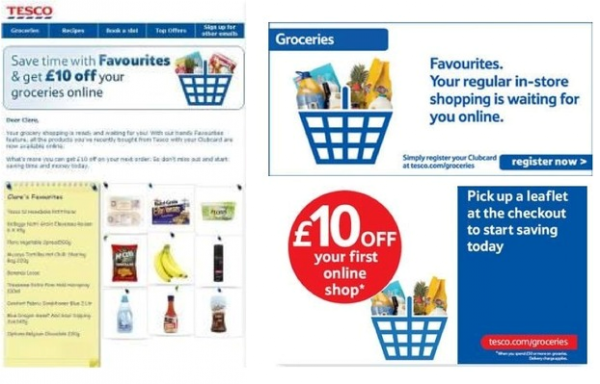 Tesco, one of the world’s leading retailers customize their email content according to the purchasing data gathered from registered customers. Aiming to conduct location based marketing campaign? Segmenting according to geography is your best. It enables you to serve your customers better through interesting offers which are targeted and optimized for both online and offline. A website visitor places an order for a product/service. You can send an email suggesting a direct pickup from a store near his location for convenience. Every business will have two main lists: 1. Active Users; 2. Inactive Users. Segment your users according to their last activity on website or digital platform. This will allow you to capture some new sales or leads from a new target audience (inactivity users) as well. Creating an emailer campaign of new products for users who haven’t logged in for the past three to six months. Your website analytics data can be of big help for segmenting emails. You can use it to create website triggers that can help you to aid and engage your customers. This will help you to increase sales closure as well. Look out for customers who haven’t completed a purchase within 24 hours (known as cart abandonment). Blast mailers that prod them into completing their purchases. Studies have shown that such initiatives boost sales by as much as 55%. Based on the data that you gather through your website and other sources, you can develop email segmentation strategies that will help you for comparison and optimizing your email campaigns. 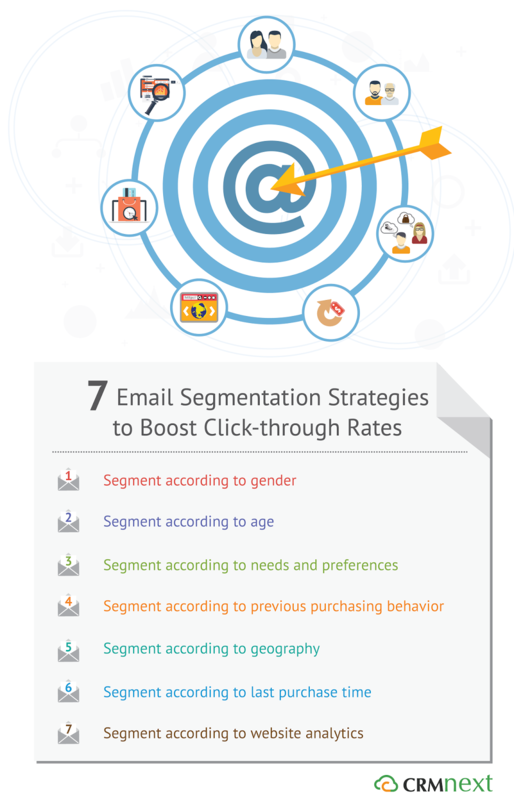 With the help of CRM analytics, follow the above seven email segmentation strategies and see your click through rates soar.